So first, a confession: I made these card boxes for a graduation party for my niece and her best friend last spring, and never got around to writing a tutorial. I ran across the pictures in my “to be blogged” file recently, dusted off my notes, and finally wrote up the instructions. Better late than never, and just in time for this year’s graduation season! Cut a 15″ x 15″ square from the foam board for the top of the box. 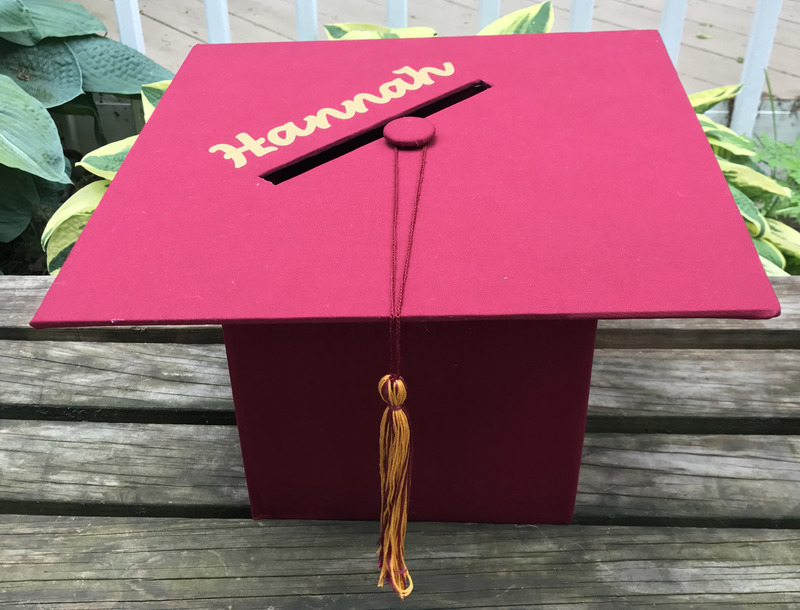 Cut a strip of fabric 38″ x 18″ for the box cover, and a square 19″ x 19″ to cover the mortarboard top. Assemble the shipping box and tape or glue the bottom shut. Cut off the top flaps and set them aside. Spray one side of the box with spray adhesive and center it on your cut fabric, about 3″ from one end. 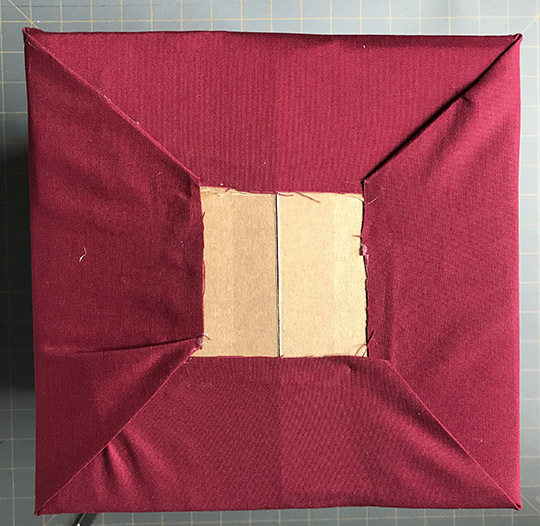 When you’re happy with the placement, spray the next side of the box and carefully roll it down onto the fabric, keeping the fabric smooth and snug against the box. Continue all the way around the box. Overlap the fabric with your starting point and glue down the last edge. Tuck the fabric into the top of the box. Run a bead of hot glue just under the edge of the fabric to hold it in place. 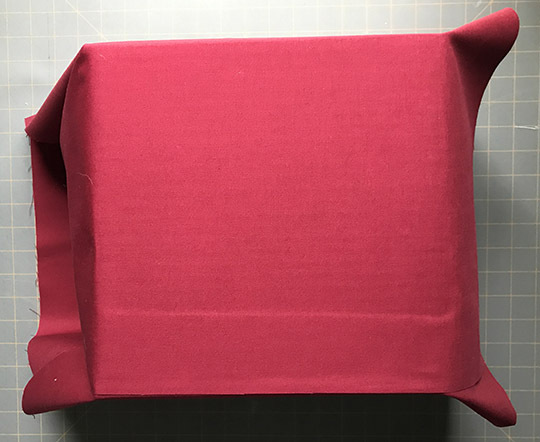 Flip the box over and fold the loose fabric to cover the bottom, the same way you would fold wrapping paper. Run a bead of hot glue just under the edge of the fabric to hold the sides in place, then fold in the corners and glue them down. Set the box aside. 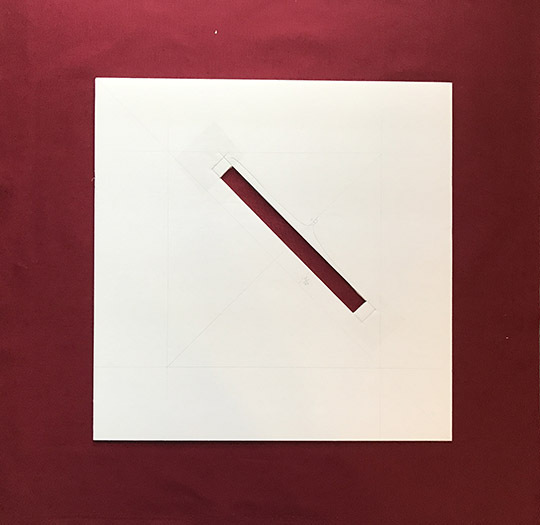 Draw two lines from corner to corner of the foamboard piece. 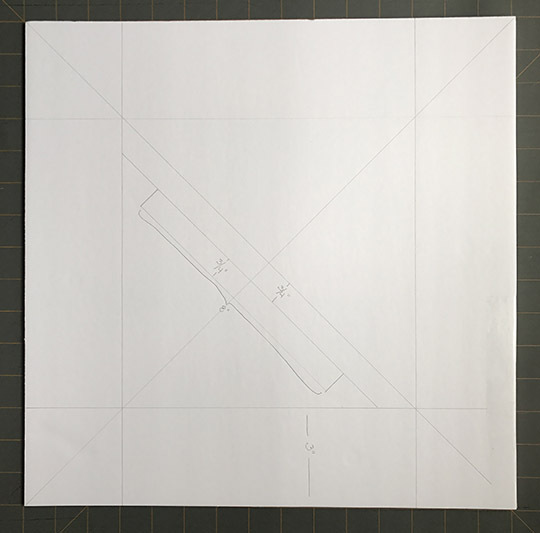 Measure 3/4″ from one of the diagonal lines and draw a second line. 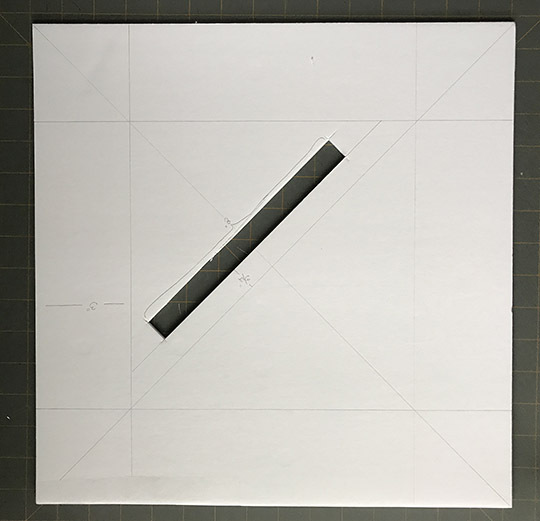 Measure another 3/4″ from the second line and draw a third line. The second and third lines are the top and bottom of the card slot. Measure out 4″ in each direction from the intersecting center line and draw two short lines to mark the ends of the card slot. Cut out the resulting 8″ x 3/4″ rectangle with an xacto knife. Spray one side of the foam board with spray adhesive. 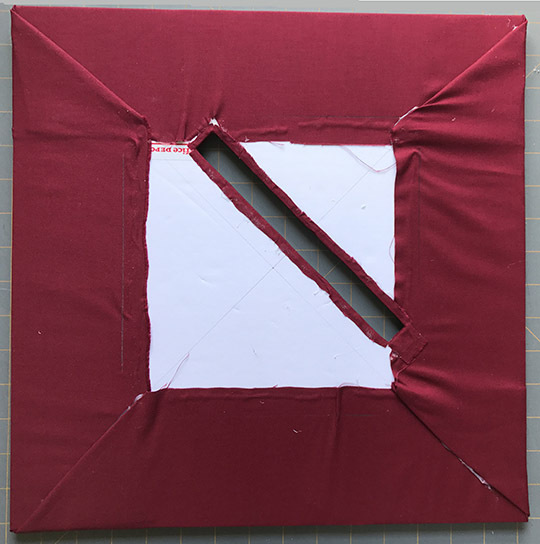 Center the foam board, sticky side down, on the 19″ x 19″ square of fabric. Check to make sure there are no bumps or wrinkles in the fabric. 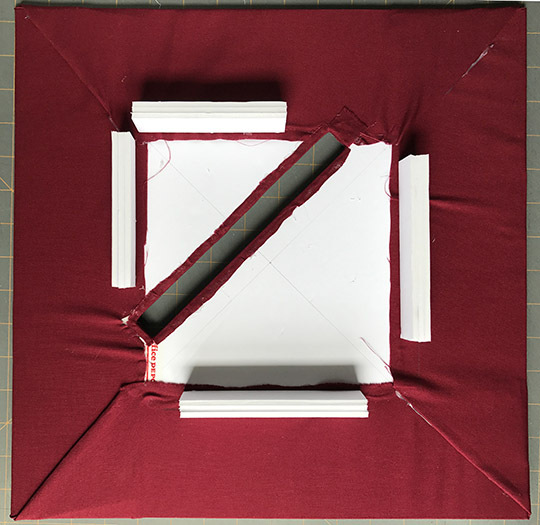 Fold the raw edges of the fabric around the foam board and glue into place. (Glue the sides first, then fold in the corners and glue them down.) Make sure the fabric edges don’t overlap the card slot. Carefully cut away the fabric covering the card slot. 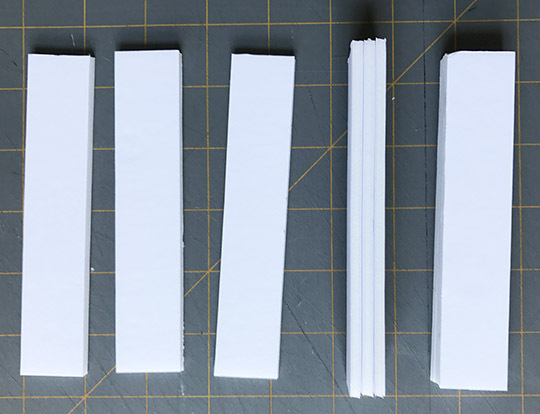 To help hold the lid in place, make four supports from leftover foam board by cutting 12 1″ x 6″ pieces and glueing them together in sets of three. Make a button to decorate the top of the box: Cut a circle of foam board and a circle of craft batting about 1-1/4″ in diameter. Cut a 2-1/2″ diameter circle from your fabric. With the fabric wrong side up, center the craft batting, then the foam board circle, on top of the fabric. Center the button on the top of the box and glue it in place. 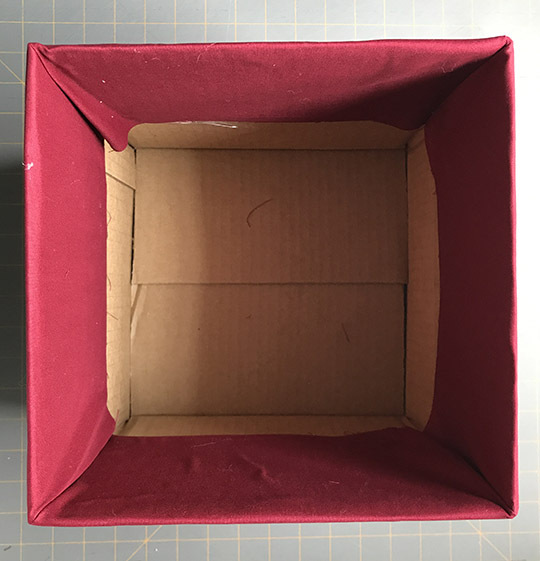 To make the tassle, first determine how far down the box you want the tassle to hang by measuring from the center of the button to the appropriate point down the side of the box. Multiply this measurement by 2 and add 2″ (so if you measure 8″ from the center of the button, for example, your total length would be 18″). Without unwinding the skein, cut a piece of embroidery floss to this length and set it aside. Remove one wrapper from each of your skeins of thread. With the other wrapper still in place, slide your scissors through one end of the skein and cut through all the threads. If you’re using more than one color of embroidery floss, mix up your threads then fold them all in half. Thread the hanger you previously cut through the loop and tie it tightly in a knot, keeping the ends of the hanger thread even. Tie a scrap of embroidery floss or matching thread around the bundle of embroider floss 3/4″ or so from the hanger – just eyeball it until you’re happy with how it looks. Tie the ends of the hanger thread together and loop them over the button on the box top. Since my niece and her friend had their graduation party together, I added their names to the boxes. I cut them out of gold paper with my Silhouette and attached them with spray adhesive, but you could also use peel and stick letters or just leave the top of the box blank. That looks so neat and professional. what a lovely idea.